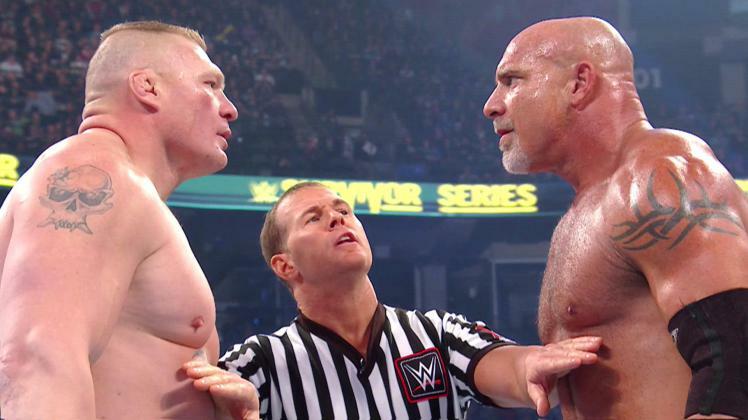 Above: Bill Goldberg (right) faces down Brock Lesnar in a WWE pay-per-view event Nov. 20. Jewish wrestling icon Bill Goldberg made a triumphant return to the WWE on Sunday night, Nov. 20, at the Air Canada Centre in Toronto after a 12-year absence from the squared circle. Goldberg, a former WCW and WWE world heavyweight champion, as well as a former Atlanta Falcon and Georgia Bulldog, went up against Brock Lesnar, also a former WWE world heavyweight champion and a former UFC heavyweight champ. The two last met at Wrestlemania 20 in Madison Square Garden in New York in 2004. 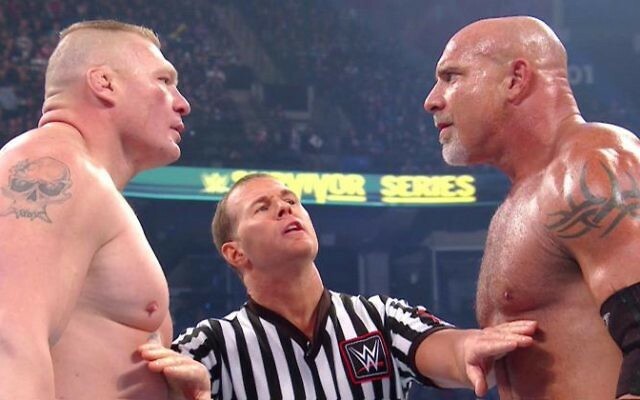 Thanks to information readily available online, wrestling fans were well aware in advance that the 2004 match would be the final WWE contest for Goldberg and Lesnar. Goldberg was pursuing other ventures, while Brock was going to try out for the Minnesota Vikings. Both contestants received negative reactions from the audience, and what could have been an amazing encounter turned into a dull affair. Goldberg won the 2004 match, something Lesnar had to live with the next 12 years. Fast-forward to May this year when Goldberg was announced as the pre-order bonus for the “WWE 2K17” video game. Lesnar was featured on the cover of that game, which enabled fans to stage a virtual rematch between the two combatants. Fantasy turned into reality when promo tours for “WWE 2K17” resulted in verbal exchanges between the two wrestlers and lured Goldberg into granting Lesnar a rematch at the Survivor Series pay-per-view event in Toronto. Goldberg said he wanted to be a superhero again for all the kids out there and to give his wife and 10-year-old son the opportunity to see him wrestle for the first time. Another Jewish wrestling figure, Paul Heyman, the advocate and mouthpiece for Lesnar the past 14 years, set the stage for the mega-event in Toronto with his exemplary oratory skills. On several occasions he pleaded with Goldberg not to fight Lesnar. The past few years Lesnar, known as the “Beast Incarnate,” has steamrolled through the WWE competition, leaving a wake of destruction. Not to be intimidated, Goldberg did not back down from the challenge. Several days before the event Sunday night, Heyman was all over social media, assuring all that his Beast would destroy Goldberg in under two minutes and leave him unrecognizable to his wife and son. The smart bet was on Lesnar, and the overall odds on Goldberg winning were low. But Heyman was wrong in his prediction. During Goldberg’s ring entrance, the Goldberg chants were deafening, and in 84 seconds Goldberg ran through Lesnar like a runaway freight train, annihilating his opponent and conquering the Beast. He hit Lesnar with two spears, which left the Beast reeling, and followed with his signature Jack Hammer for the decisive pin. It was quite a performance by a man who had not competed in the ring for 12 years. The question that remains to be answered is who’s next for Goldberg. Or was this a one-time return to the ring? On a side note, my son Bradley Rudy won his first JV wrestling match the same weekend for the Walton High Raiders. While the high school mat is vastly different from the sports entertainment world of the WWE, one can only wonder whether chants of “Rudy” will one day fill the air of WWE arenas.